Dominique G lives in France, and has made up two of my kits in a typically French style. 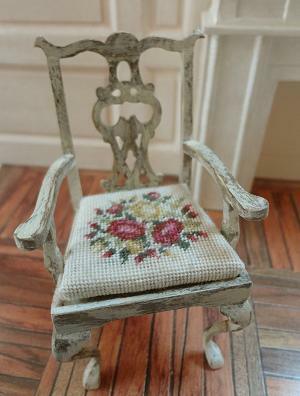 The Summer Roses dining chair kit has been stitched up as per the kit, but the chair itself has been finished in a ‘shabby chic’ painted and distressed finish (rather than giving it a varnished wood finish), which looks great. 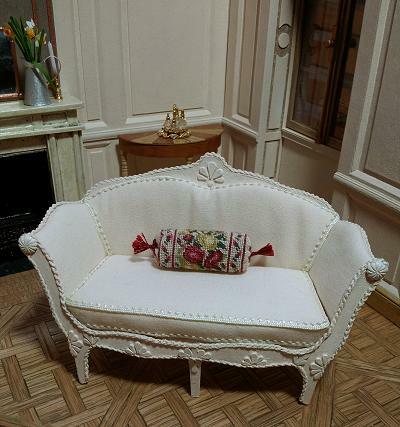 She has also stitched the matching Summer Roses bolster cushion, and has chosen to display it on an elegant sofa of her own, which is also in the shabby chic style. This painted finish works really well with the Summer Roses designs, doesn’t it?